Las Vegas • Utah State and Fresno State staged a pair of one-point games this season. Absolutely nothing like that happened Friday night in the Mountain West semifinals. USU blistered the Bulldogs with 50 first-half points on the way to an 85-60 victory at the Thomas & Mack Center. The No. 2-seeded Aggies (27-6) have advanced to their first MW championship game in six years of membership and will meet No. 4 San Diego State, an upset winner over Nevada, for the title Saturday (4 p.m. MDT). Junior guard Sam Merrill, the conference’s Player of the Year, led USU with 22 points, five rebounds and five assists. Merrill scored 18 points in the first half as the Aggies built a 50-27 lead. USU coach Craig Smith said, “We played well on offense, but I thought we were even better defensively,” holding the Bulldogs to 5-of-26 shooting from 3-point range. Diogo Brito added 20 points and seven rebounds off the bench, following his 14-point effort in Thursday's 91-83 defeat of New Mexico in the quarterfinals. Abel Porter scored 11 points, Neemias Queta posted 10 points and 13 rebounds and Brock Miller also had 10 points. 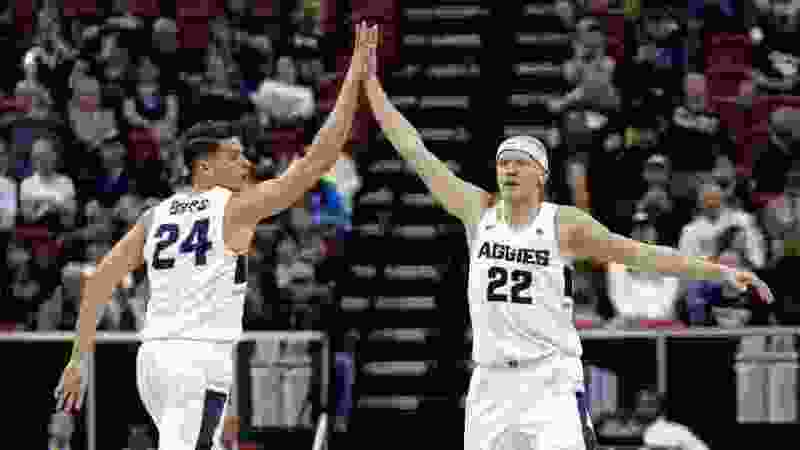 The Aggies recorded 23 assists – “The ball had great energy,” Smith said, in one of his favorite sayings – and committed only nine turnovers after having 24 against New Mexico. Brito was scoreless in the first half vs. the Lobos, so his 34 points have come in the last three halves. “I’ve got to give some credit to the bald guy over here, our coach,” Brito said, recounting a recent conversation with Smith as they sat on the postgame dais. That comment captures Smith’s relationships with his players. So did his insistence that the postgame interview transcript reflect it was past Merrill’s bedtime. In any case, the Aggies will be back in the building Saturday afternoon, when they can win a tournament title after sharing the regular-season championship with Nevada. USU is solidly within the NCAA Tournament field, according to ESPN's Bracketology, but the Aggies would love to claim the MW's automatic bid. “Our main goal is to cut down some nets [Saturday]. That'd be pretty fun,” Merrill said. The road team had won each game dramatically in the regular-season series between the Aggies and Bulldogs. USU dominated the neutral-meeting in every way, holding Fresno State to 5-of-26 shooting from 3-point range. The Aggies shot 52.8 percent from the field in the first half to FSU's 35.5 percent. When the Aggies missed shots, they often got offensive rebounds, resulting in 10 second-chance points. Brito provided 11 points off the bench in the first half and Queta posted eight rebounds. USU's explosive offensive performance came after the Aggies scored 52 points in the second half against New Mexico. In Friday's second half, the Aggies once led by 35 points and Fresno State (23-9) never got within 20 points. So now the Aggies will meet SDSU, after the Aztecs knocked off Nevada 65-56 in the early semifinal game. In contrast to USU's recent history with Fresno State, the home team had an easy time in each game between the Aggies and the Aztecs. USU's defense was the driving force of a 70-54 win Feb. 26 in Logan, the Aggies' first victory over SDSU in the MW era. USU’s rout in Friday’s late game created some extra rest for the starters. That was a healthy development, with the Aggies facing a shorter turnaround than SDSU going into the championship game.